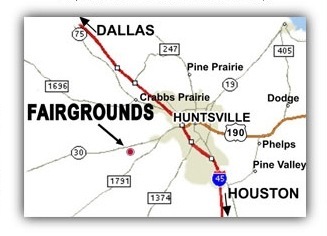 I-45 traveling North, exit 116 Highway 30 in Huntsville and turn left onto Highway 30. 3925 HWY 30, 77340 zip. Drive appoximately 3 miles and the show will be on your left. Walker County Fair Grounds. I-45 traveling South, exit 116 Highway 30 in Huntsville and turn right onto Highway 30. 3925 Hwy 30, 77340 zip. Drive appoximately 3 miles and the show will be on your left. Walker County Fair Grounds.